Wall Street Journal is Largest Daily Newspaper in U.S.
Posted on 05 May 2011. 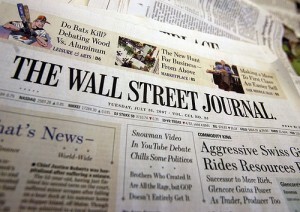 A new report says The Wall Street Journal is the largest daily newspaper in the United States. The Journal, which is owned by News Corporation, has an average daily circulation of more than 2.1 million published in New York City. The national American newspaper, USA Today, ranks second with a total of 1.8 million average daily circulations based on the recent report released by the Audit Bureau of Circulations. It has the largest increase in total average circulation since March 2008. The New York Times ranks first in the Sunday newspaper category. It has an average circulation of 1.4 million while Los Angeles Times has 948,889, and ranks second. The total average circulation is a new method that measures the publication’s paid and verified print, as well as digital editions. Paid and verified branded editions are also included in the total average circulation. Previously, total average circulation is compared to previous periods. However, ABC advised not to make direct comparisons to earlier periods. A report from ABC says the top-line metric followed by the newspaper industry no longer exists. Thus, comparisons to earlier periods are not anymore significant because of the certain changes in the rule. Meanwhile, Dayton Daily News has an average daily circulation of 94,709 and a Sunday average circulation of 144,226 Sunday. Middletown Journal, of Butler County, has a total weekday average circulation of 13, 794 while it has a Sunday average circulation of 16,252. Clark County’s Springfield News-Sun has a Sunday average circulation of 26,273 and average weekday average of 19,634. Khot Dominise - who has written 55 posts on Your Daily News Fix.